Updated May 30, 2015: The staff presentation is now available online. Some illustrations from it have been included in the article below. At its May 27, 2015, meeting, the TTC Board received a presentation from Rick Thompson, the Chief Project Manager for the Scarborough Subway Extension (SSE). This presentation is not yet online. During the presentation, Thompson noted that the process of winnowing down nine alternative routes for the SSE was nearly complete, and that a report on the three short-listed options would be issued fairly soon. Via the SRT as currently constructed. Via Eglinton and Midland, then swinging back into the SRT right-of-way north of Eglinton (this would avoid reconstruction of Kennedy Station on a north-south alignment). Via Eglinton and Midland, joining into the SRT alignment near the existing Midland Station. A Midland/McCowan option would swing into the Gatineau hydro corridor south of Lawrence to link northeast to McCowan and then follow the McCowan route north. A Brimley option would travel east on Eglinton, north on Brimley and then swing northeast through STC to McCowan. 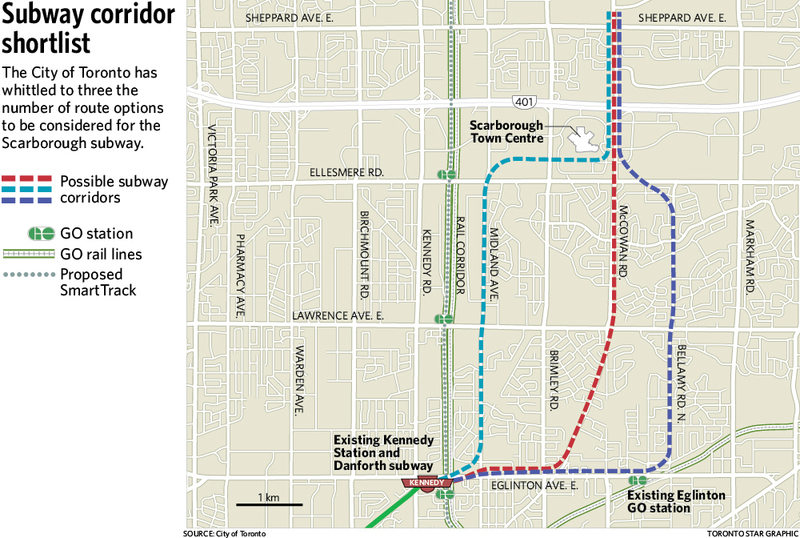 A McCowan option would follow Eglinton to Brimley, then swing north via Danforth Road to McCowan. This was the original proposal approved by Council. A Bellamy option would follow Eglinton to Bellamy, turn north, and then swing back to the northwest to reach the McCowan/STC station. A Markham Road option would follow Eglinton to Markham Road (although the exact alignment east of Bellamy is unclear), then turn north and eventually back west to McCowan. This is the most roundabout of the possible routes. Events overtook the plans, and a report on the shortlisted options that had gone privately to Councillors made its way into the media. 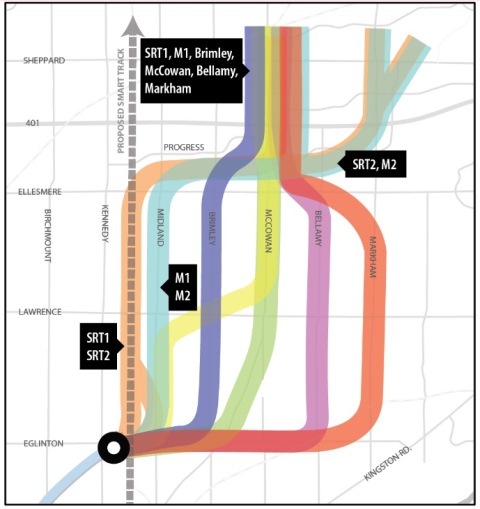 The Star’s Jennifer Pagliaro reported that the three remaing options were the original McCowan alignment, the Bellamy alignment and the Midland route running straight north to meet the SRT corridor.